The challenge phase for this "Tutorial #1 - Sudoku" has ended. This page is provided as a reference. You can also find our version of entire script at the end of this page. Sudoku (https://en.wikipedia.org/wiki/Sudoku) is a well-known number puzzle. There are numbers of algorithms to solve Sudoku as explained here: “Mathematics of Sudoku” ( https://en.wikipedia.org/wiki/Mathematics_of_Sudoku), and we will be using DA to solve this puzzle instantly. As mentioned, current DA can solve up to 8192 bits of solution space. We will be limiting the use to 1024 bits for this tutorial. 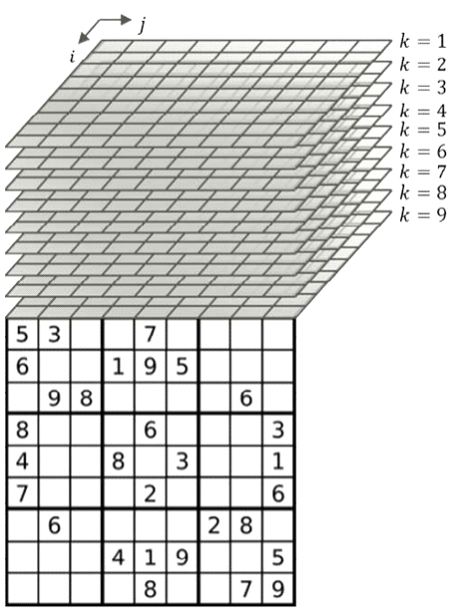 For Sudoku, there are 9x9 cells where each cell can take numbers from 1 to 9, making 9x9x9 = 729 cells total that can be expressed in 0 or 1 to represent each number which will fit into the solution space. We define that Xijk will represent each cell in 9x9x9 solution model. Each Xijk can have value of 0 or 1. <i, j, k> → ((i - 1) * 9 + (j - 1)) * 9 + k - 1. For example of the above, the bottom right cell has a number of 9.Within 9x9x9 solution model, this means that X999 = 1, and all other cells of i=9 and j=9 are set to 0 (zero). As you can imagine, since Sudoku can only have 1 number in a single cell, once some bit in the k is set to 1, all other vertical k cells of the same i and j must be 0. This will be the key step to solve a problem using DA. You must define all constraints that the problem can potentially take, and create mathematical formulae for them. 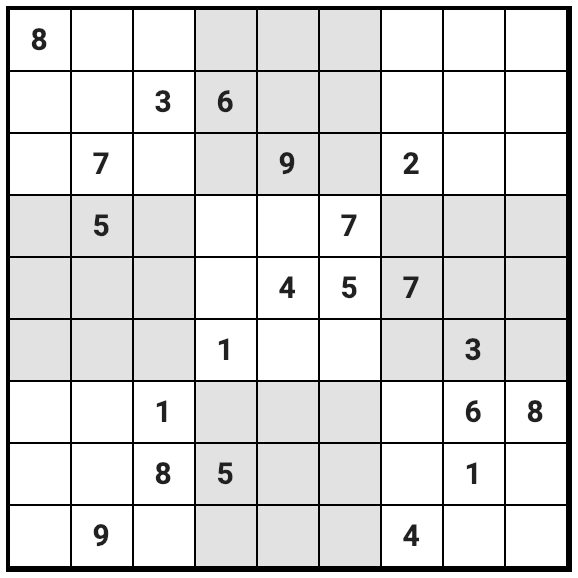 For Sudoku, there will be 5 constraints from the rule of the puzzle. A single cell can only have 1 number. Here, we introduce a penalty weight α. We are using the same penalty value in this formulation. In other problems, you can try to use different weights for different terms if there magnitudes vary. As we have defined the Objective Function (H) at the previous step, we will now begin to code the solution in Python. Step 1) Create initial hints. The format: (column, row, digit); they are all from 0 to 8. We’ll use the following helper object to build QUBO. In addition, we provide an example of our variable ID generator. There is an important observation before we write the code: when x is binary, x^2 and x are equivalent. This is extremely useful in the later development. Please keep this in your mind. n:                 The number of binary variables that can be handled by this quadratic polynomial. The variables are numbered from 0 to n - 1.
array:             The numpy array showing this quadratic polynomial. array[i][j] (i <= j) is the coefficient of x_i * x_j. Since all variables are binary, x_i and x_i * x_i are the same variable. constant:          The constant value of this quadratic polynomial. if i > j: # make sure it is an upper triangle matrix. In all these rule preparation, we will leave the multiplication of the penalty factor at the end. This part is quite similar to the column rule. We leave this part as your exercise. # there can be only one k in the same subgrid. Since DA API is not opened to public, you must call `solveDA` function with BinaryQuadraticPolynomial object as the parameter. This `solveDA` will be swapped to make actual call to DA API when you submit your code. result = solveDA(puzzle_rule)  # Call DA API and return result. return result  # Return the result of solveDA function. During the evaluation, we will call your `main` function with hint_hardest to execute your script. Due to how platform is hooked up with DA API, your scripts will be run one by one with other participants’ script. This means that your script will be put in a FIFO queue to run, and you might not be getting the results back immediately. You can only run scripts that are intended to solve the provided learning challenges and the Marathon Match. The platform will be checking if your scripts are making the same expected call to DA API for the learning challenges. Initial Sudoku hint also needs to be the same for this tutorial submission. Each member can make maximum of 10 submissions for this challenge. The first 30 members to win a prize will be chosen after the submission phase is over. DA is scheduled to have maintenance downtime on Feb. 7th JST (Feb. 6th 10am to 7th 10am EST). If you submit during this time, your submission will be queued and executed after the maintenance. Once you have submitted the script, the system will send you an email that it has successfully received your script. After your script has been executed, the system will send you another email with results. When successful, the result of DA API will be provided in addition to the Sudoku puzzle that got solved. In case of error you will see a message of possible reasons, please try again to re-submit. Please ask in the challenge forums if there are any questions. As seen, DA can take QUBO formulation and solve the problem at stake. There are many algorithm to solve Sudoku. But as we've shown in this tutorial, you can easily change the rules like variation of grid sizes or imposing additional constraints such as making main diagonals to also be unique, instantly. This is especially useful in solving real-world problems and we will be showing you some scheduling problem in the next learning challenge. As the submission phase for this tutorial #1 has ended, we are showing the proposed entire script provided for your reference. return solveDA(puzzle_rule)  # wrapper to call DA API and return results.